It’s a simple gag, but that just underlines how great it is. Colbert and Dinello replaced the fiddle part from Charlie Daniels’ original with bassoons, which is already funny because bassoons are inherently funny, but they threw in another twist: Neither of the comedians had ever held a bassoon before, and playing the bassoon is much harder than it looks. The two of them spend over a minute in the clip pretending to tune the instruments, making sure they’re properly aligned, and stomping along to the beat, but nothing comes out when Colbert finally brings the bassoon to his mouth. The rest of the video involves Colbert and Dinello reciting the lyrics and showing off like they’re god’s gift to bassonery, all while they struggle to get a sound—any sound—out of the enormous woodwinds. 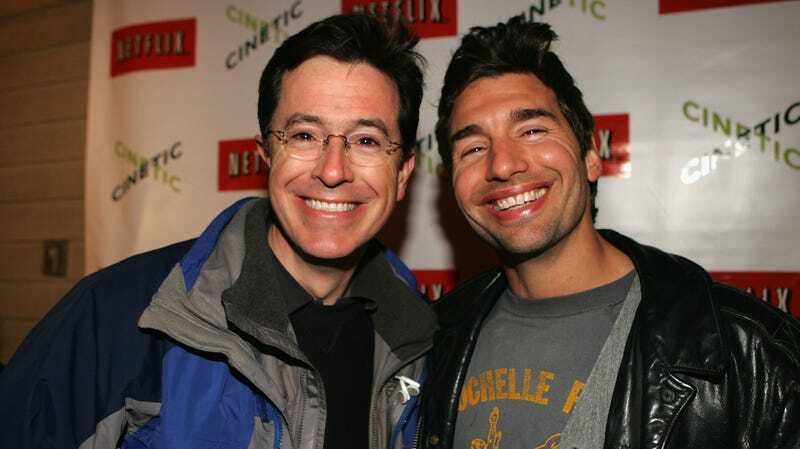 In an alternate universe where Stephen Colbert never became a successful talk show host, he and Dinello could’ve built an entire stand-up routine around poorly performing songs that are all about playing an instrument really well. Thankfully, our universe at least has this one incredible clip.